Throughout the year I have been fascinated to observe the intensity of thought that some of my preppies have put into their block constructions. One child in particular, carefully selects and considers the placement of each and every block he uses. His constructions and their exploration of balance, shape and complexity are astonishing. Late last term he brought in some metal nuts, bolts and springs he had collected from the site where a bus had been repaired after breaking down. He asked if he could look at them on the light box and experimented with putting them together in interesting shapes and patterns. It was only whilst discussing these loose parts with him, and listening to his thinking about where they might have belonged on the bus, that I realised he was interested in, not just how things were constructed but also how they could be deconstructed and so our Tinkering Table was born! I had seen a post on the wonderful blog Irresistable Ideas for Play Based about just such a table and immediately looked for a place in the classroom to add our own version of it. For now we are using the water trough because it stops the different parts and paraphernalia from falling to the floor but with summer fast approaching I will soon need to find an alternative. Our sound for the week was /v/ and so it seemed appropriate that the first object we should deconstruct was a vacuum cleaner. We added a set of screw drivers and waited to see what would happen. 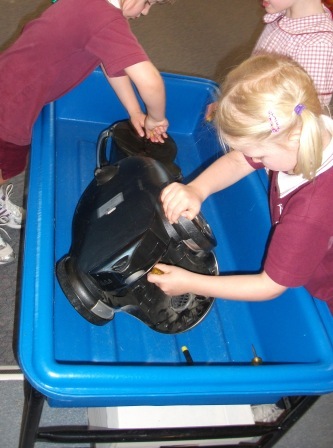 At first the children explored the vacuum cleaner as a whole, opening and closing all the different compartments. They were excited to discover the cord could still be pulled out and retracted. An action they repeated over and over again. I was interested to observe that it was only after I posed the question “I wonder how that works?” that some of the children, including the child who had collected the nuts and bolts from the bus, chose to begin using the screw drivers and try to open it up. 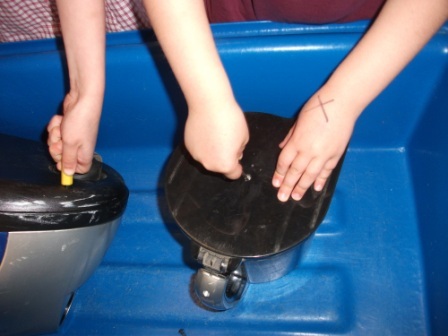 Once they got started, the children demonstrated great persistence and concentration as they used the screw drivers and there was lots of celebrating when the first screw was finally undone. One down……… many, many more to go! Mathematical understandings were enhanced as the children matched the size and type of screw driver required to the screws, learning during the process, the difference between flat headed and phillips head screws. As one part was opened up another problem would arise, as the children worked together to think through what needed to be undone next. They discovered that there was a system to deconstruction, just as there is a method to construction. 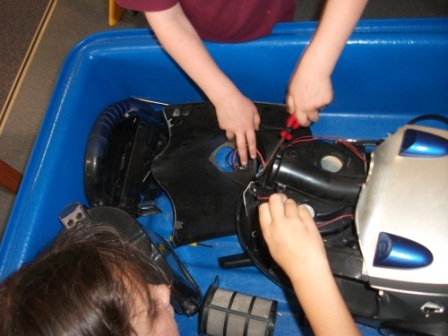 The children have also discovered that deconstruction is not a quick process but when another part have been released from the screws holding it together, they are another step closer to finding out how it all works. 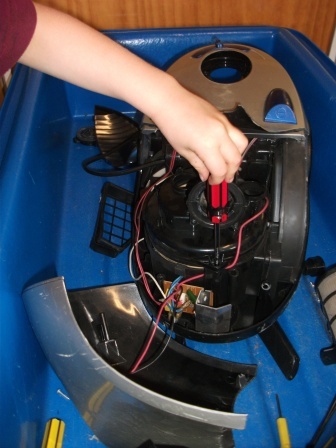 After 2 weeks of hard work the children have finally gotten through to the section of the vacuum that contains the motor and we are all really looking forward to this next stage of deconstruction. 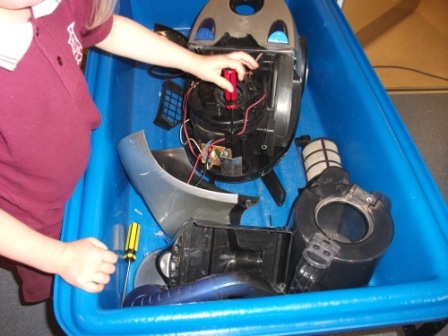 Who would have thought that a simple everyday vacuum cleaner, a machine that can be found in almost every home would become such a long term and interesting project? 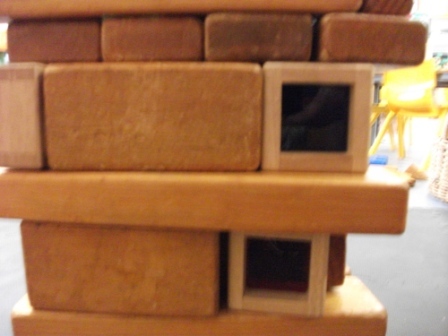 Certainly not me….. but from now on I think that, just as construction with blocks and other materials is an everyday activity in our classroom, so too will be deconstruction at our very own Tinkering Table. Super cool! 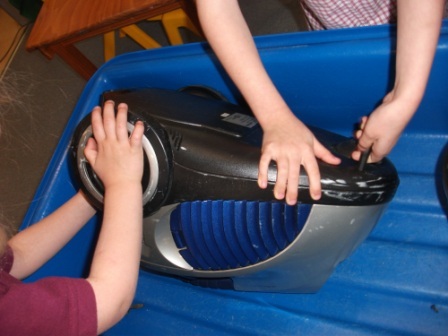 I need to find something for my kids to tinker with!